1964 – Actor Sidney Poitier was awarded the Academy Award for Best Actor for his role as a laborer in the movie Lilies of the Field. 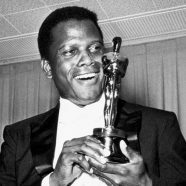 Poitier was previously nominated for an Academy Award (Oscar) in 1959 for his roe in The Defiant Ones alongside Tony Curtis. After years of Blacks only being offered subservient or demeaning roles in major motion pictures, Poitier was known for insisting on dignified roles and had become America’s top Black star and its first Black male to win an Oscar (Hattie McDaniel was the first Black to win an Oscar, as Best Supporting actress for her role as a maid in Gone With The Wind).